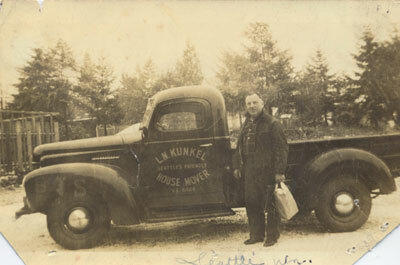 We are one of the oldest family-owned House Moving companies in the Seattle Puget Sound-Western Washington area. 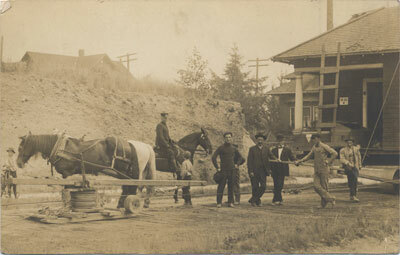 In 1909 Lawrence Kunkel (my grandfather) came to Seattle from South Bend, Washington with a background in logging and rigging. He settled in Ballard, Washington with at that time was an independent city. Taking a job in the ship yards he worked all week and in the evenings and weekends, he worked, for an Uncle related by marriage, who was already in the structural and house moving business. After two years Lawrence had saved enough money to open his own company. It was 1911, things were happening in Seattle. 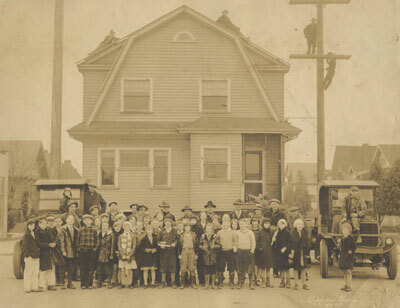 The Denny re-grade was still underway, Seattle was expanding, and finally in 1917 he was able to buy his first truck. The business continued to grow until 1929 when The Great Depression gripped the country then everything came to a standstill. After about three years things began to slowly loosen up. The business had been able to hang on. Things slowly improved over the next few years. In 1937 barely a young teenager Ken Kunkel (my father) found himself thrust into the heart of the business. He was working a full time job and going to school. To round out Ken’s experience in the moving industry his father insisted he work for a variety of other companies, one being Curtis Bros. A company that Lawrence Kunkel and Frank Curtis shared many joint ventures together and were good friends. After a few years passed, an odd thing happened, the world decided to go to war. In 1941-1942 Ken and the crew were working in Silverdale Washington when Ken told his father he was going to lunch. Well that lunch break lasted till 1952. Almost ten years, Ken served in both World War II and Korea. He resigned his post as a Regimental Sergeant Major 2nd Infantry Division. When Ken returned home, the first thing his father said was “kid that sure was a long lunch”. In 1954 Lawrence suffered a stroke leaving him disabled and confined to a wheel chair. Ken took over the business. In the late 1950’s I5 came through Seattle. Everybody in the moving business worked day and night clearing the right of way of houses and buildings for six years. It was mayhem…when it was over things returned to normal. I remember as a young boy going out and working with my father. Other kids played with toys, I played with bulldozers, winch trucks, cranes, jacks and blocks (not the kind that would normally come to mind when you think of young boys). I joined the business in 1974 after graduating from school. My father and I worked together for almost twenty-one years. In those years we’ve seen a lot change in the Pudget Sound area and the for the most part we were there first. In a field so specialized it’s important to understand some of the tools required to perform quality work and a safe environment (jacks & dollies). We have chosen Jahns Structure Jacking Systems as our primary system for raising buildings, etc. First for reliability and dependability after all we are working under the load. We take great care to examine, repair and replace any hoses, fittings or jacks as needed. We make no compromise for safety or the security of our projects. For relocation projects (houses, unusual objects, etc.) we utilize a variety of different dollies, from Holland low profile where every inch of overhead clearance is vital to industry standard which load up to a foot higher. All have hydraulic cylinders capable of interaction between one another and air brakes for complete control of heavy loads on down hill and precision locating demands. Being a small business family operated, it’s most likely that all the communication, whether email or phone will be with either me or my wife Robyn. My expertise and strong points lie in the field from estimating to interacting with general contractors and homeowners to project fruition. Robyn’s expertise lies in her knowledge of contracts, insurance and finance. With twenty two plus years in the finance and lending industry she fully understands the hurdles sometimes encountered when trying to obtain special funding, working with insurance companies, etc. Together we cover the full gamete of the demands of the industry. A plus when a client calls with a concern, there not just talking to an estimator or a receptionist, your talking directly to an owner.